I was fortunate to be allowed to attend BETT in London last week. The exhibition provides an opportunity for companies to showcase the products that they have created to support schools using technology. It’s a huge affair and increasingly attracts companies and delegates from Europe and beyond. In addition, there are seminar areas offering a rolling program of drop in talks. In my experience the most useful of these are given by teachers showcasing what they are doing in the classroom. I attended a talk on using Minecraft in the classroom. It alleviated any concerns I had and enthused me to give it a go. I just need some money to buy the edu version and a school to work with! Rising stars are bringing out some materials later this year and there is a free sample to download from their website. This explains really well how to manage Minecraft so that it provides a safe environment for children in school. I also attended a talk on Power Bi in the Microsoft area. This is a free downloadable tool or part of Office 365. I’ve looked at this before as its tagline is” bringing data to life” which definitely appeals to me. The talk wasn’t useful to me as it was geared towards academy trust management but I still think it’s a useful area to explore. Some products really excited me. Codebug is a cheap (Surprisingly it’s cheaper to buy this from Rapid Electronics than directly from Codebug) programmable device with a 5x5 LED display. The programming is done using a web tool and it’s powered by a watch battery. At £12.50 each I’ve already ordered some for my digital leaders to have a go with. 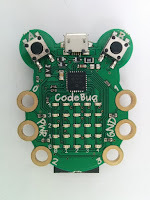 I recently used some crumble boards at Carrington School and was amazed by how easily they applied their programming experience gained in Scratch to another drag and drop programming language. One of the most impressive things I’ve seen this year. I have high hopes for the Codebugs. If you are an iPad school you probably use the Explain Everything App. They now have a resource (annual subscription) which allows simultaneous editing by pupils of a file. A bit like a wiki but using all the wonderful features of Explain Everything. This really impressed me. Sometimes you see something at BETT that isn't relevant to your role but you can see it's usefulness nevertheless. This was the case when I visited the VEO stand. They have a tool that can be used in lesson observations. Observations are videoed using a tablet and key moments are tagged using a variety of fields (eg, type of questioning, type of activity)f or later reflection. Targets can be negotiated on the basis of the data gathered and teachers can be paired with colleagues who can support them. I have passed the information onto a colleague but if you are looking for a tool to help with observations this might work for you. Another useful thing about BETT is that you can look at things and decide that they would not meet your needs, thus saving your school money. It would not be appropriate for me to mention those here! If you get the opportunity to go next year I would recommend it. Careful choice of seminars would be great CPD.